Talofa and Greetings from Piula land. God has been so great and unpredictable as always. He has opened our eyes to his power, and miracles are numerous in the life and work of this community this academic year, 2018. We continue to give him praise and honor. Our journey has been a cruising with the wind after the celebration of our 150 Anniversary in June. We then began this semester in August on high spirits, knowing that the anniversary celebrations has boost our confidence and hope to move forward. We have witnessed the support of our families and friends, partners, and the Church in particular. Now, we are enjoying the newness of our facilities and especially the single students at their new rooms, lecture theatre, dining hall, and common room (with their TV sets). Our worship services are mostly gratifying with the new comfortable pews and the new look of the chapel; its Methodist openness and natural lightings from outside. Last month, we hosted two visiting professors from Germany, and we would like to say faafetai tele and thank you to Professor Hans Kuhlmann and Professor Menno Aden of the Lutheran Church in Germany/Bavaria, who have helped us in teaching ‘Reformation’ and ‘Church Fathers’ for three weeks. We hope that you have enjoyed being with us, and the refreshing spirit of our natural cave pool offered you some hope to visit us again. Some of our staff members have been away for conferences and meetings in the past two months. Revd. Dr. Sanele Lavata’i (Dean of Studies) has been part of the Samoa Qualifications Authority visiting team. Also, Lavata’i and Titimaea Titimaea have represented Piula and the Methodist Church of Samoa to the newly founded Samoa Bible Society, who deals with a revised translation of the Old Testament into the Samoan language. Dr. Mercy Maliko has represented Samoa to the CEDAW (Convention for the Elimination of Discrimination Against Women) conference held in Geneva at the end of October. Dr. Sanele Lavata’i and I have attended a Conference (the first ever) on Postcolonial Biblical Hermeneutics at Hamburg University in Germany, Sept-Oct. I have also been attending the Pacific Conference of Churches held in Auckland NZ at the beginning of November. There has been some Good news for our community this month. 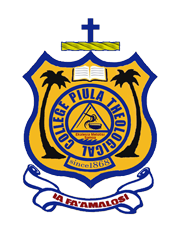 Dr. Upolu L. Vaai a former student and lecturer of Piula is the newly elected Principal of the Pacific Theological College in Suva, Fiji Islands. Dr. Iosefa N Lefaoseu, who was on Piula Faculty development has been graduated with a PhD in biblical studies at the Pacific Theological College, Suva. We have raised $244,000.00 at our May Offering this year for the work of the Church. We thank our families and friends for the support, and may God bless the hand that gives. This is November, and after our final examinations on the 29th and 30th, it is time to anticipate the Christmas holidays. But not yet folks, we have a Manuao Project, our choir contribution to the Spiritual thoughts of our people during the festive seasons. Faafetai tele and Season’s Greetings!! On behalf of the faculty, students and the Piula community, I wish to express our sincere faafetai tele to all our families and friends, the leaders of the Methodist Church of Samoa (stakeholder), as well our partners and visiting friends, for making 2018 such a successful and enjoyable year for us. Your prayers and thoughts have helped us in such a long journey. We hope and pray that you all deserve to enjoy a very merry Christmas and a prosperous New Year.